If parents want to disciple their children effectively, learning to hear the voice of God through the gift of prophecy is essential, according to the pastor of the largest church in Colorado. And the gift holds the key to bringing God's healing to people in pain. 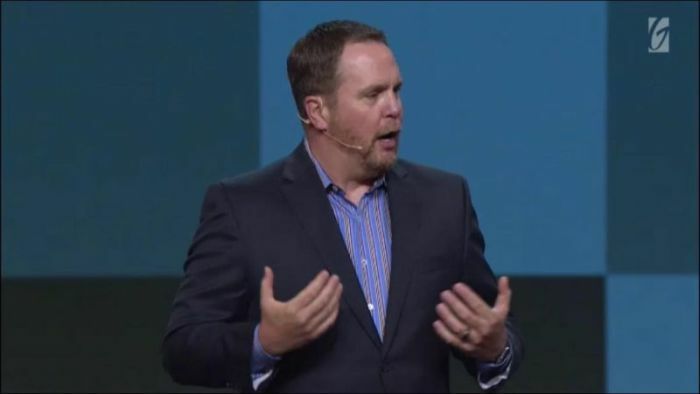 In a sermon earlier this month at Gateway Church in Texas, Pastor Brady Boyd, who leads New Life Church in Colorado, explained how the gift of prophecy is to mark the life of the believer, and that when non-Christians are around Christians they should experience the power of the Holy Spirit operating in their lives. And this gift is to impact in every area of life, including marriage and family. When most people think about the gifts of the Spirit they think of 1 Corinthians 14, the Apostle Paul's explanation of the spiritual gifts, Boyd explained. But Numbers 11:29 is an often overlooked passage on this subject of prophecy. "I wish that all the Lord's people were prophets, and that the Lord would put his Spirit upon them all," Moses says in that particular text. Boyd added that the Apostle Peter explains in Acts 2 that one of the most power evidences that the Holy Spirit is present with people is that they will prophesy; the birth of the church, which is recorded at Pentecost, entailed the fulfillment of what the prophet Joel prophesied when God said he would pour out His Spirit on all flesh and that sons and daughters would prophesy. "The entire narrative of the Bible talks about this powerful, spiritual gift," Boyd said. "Even on my servants, both men and women, I will pour out my Spirit in those days, and they will prophesy," he said, quoting Acts 2:18, noting that in 1 Thessalonians 5:20, Paul exhorts believers not to treat prophecies with contempt but test everything against the Scripture. Everything that God gives us through the Holy Spirit is for good, he said. He recounted that the gift of prophecy has transformed his marriage, changed the way he parents, and has caused him to become friends with the most unlikely of people. "We're not supposed to be sitting on the sidelines watching God do His work. God's Kingdom comes through God's people ... with the help of the Holy Spirit." "What would change in your life if you brought the Holy Spirit into every conversation?" he challenged the audience. Most people are longing to hear God's voice but need someone to come alongside and confirm it to them, and many have made the subject of prophecy more complicated than it is, he went on to say. And often times the Lord has quickened him to say something that was exactly what someone needed to hear, a word that bolstered someone on the journey of hearing that still small voice of the Lord. Another question Boyd asserted that is important to consider when learning how to speak into the lives of others prophetically is: "What pain have they experienced that God wants to comfort? "If you want to participate in the work of God in the Earth, you ask this question before you get in front of someone," he said. He shared a story about a man he knew in his church who was extremely mean and divisive. This man was such a problem that Boyd called a pastoral meeting with him to urge him to worship at another church. But he decided to pray and ask God what kind of pain this mean man might have experienced that He wanted to heal. No sooner had he prayed, the Lord prompted Boyd to ask that man about when he was a 9-year-old boy hiding under his bed from a dad who beat him up. Upon doing so, this man, who was in his 50s, almost fell out of his chair sobbing, "ugly crying," Boyd said. As it turned out, the man's father routinely beat him up when he was a child and he made an inner vow that he would never let another man in authority hurt him. Boyd had said some things from the pulpit that this man considered hurtful, things that had triggered his rage that he had previously projected onto other male authority figures, including Boyd. This man's life has totally changed, Boyd continued, because the "secrets of his heart" were "laid bare," which is precisely what 1 Corinthians explains is the purpose of the gift of prophecy. The gift is also to be used such that unbelievers, when they hear prophetic utterances, might worship God and recognize His presence. For the people of God to do the work of God and to speak the truth of God in love such that people might be set free, the gift of prophecy is essential, he said. Another component to prophecy is listening, he said. "Listening is intimacy, and God has always wanted intimacy," Boyd said, explaining that prophecy requires God to speak and us to listen, and it has impacted how he parents. When Boyd's son, Abram, was 19 years old he could tell something was going wrong in his life. But Abram would always pretend everything was fine whenever he was asked about it. Boyd took him out to lunch one day and told him that if he did not open up and explain what was wrong he "was about to ask the Lord" with expectation that God would reveal what was going on. When Boyd said grace over the meal he prayed simply that God would show him what was going on in the life of his troubled son. Upon opening his eyes, to his son's shock, Boyd told his son exactly what was going on, which he did not tell the congregation as it was deeply personal. That day established a deeper bond between them, he said. "Moms and dads, you want to disciple your kids? You have to teach them how to hear the voice of the Lord. That's the only way you'll ever disciple your children."